There two big, emerging areas of value creation in the crypto space. These are centred around what we call ‘Money-ness’and ‘Governance’. We added the suffix ‘- ness’ after money to emphasise the breadth of this category. Money-ness encompass everything from a global store of value to a currency specific to a crypto-economy or use-case. The categorisation of crypto assets is oftentimes not clearcut (actually, almost never clearcut!). Take Bitcoin as an example. It’s deflationary and limited in supply, global, and not issued by a central authority. These qualities make it look very similar to gold. On the other hand, however, bitcoin derives value from being used as a currency to pay for goods and services. This is because it is easy and cheap to transfer globally and highly divisible. Settlement in Bitcoin has occurred globally on average every 10 minutes for almost a decade; Bitcoin’s smallest unit, a Satoshi, is one hundred millionth of a single bitcoin or 0.00000001 BTC. In this sense, it acts as both a digital gold equivalent and as an M1 (or cash) equivalent. With the introduction of the Lightening Network, the dual-character of bitcoin becomes even more pronounced. On the other end of the money-ness spectrum you have pure utility tokens. Utility tokens are used to pay for a good or service in a particular crypto-economy, much like a laundry token is used in the physical world. The category of money-ness is thus very broad but the defining question should always be "can this token act like money?". Not all tokens in this the money-ness category are created equally for value accrual purposes. In our opinion, in the long run store of value forms of money-ness will accrue value while utility tokens won't. This is because of the relative velocity, or turn over, of these forms of money-ness. An example of a utility token is Binance Coin (BNB). BNB is used to pay transaction fees on the Binance crypto exchange. The major issue with the explosion of utility tokens is that if every good or service had its own token, we would all be driven mad trying to keep up with such a variety of currencies. No one would want to hold onto hundreds of utility coins that pay for hundreds of separate goods or services. The implication from all this is that the velocity for many if these coins is likely to be very high, and therefore the value of utility tokens will be low. Because of this velocity problem, teams behind ICOs, developers and investors have attempted to artificially lower velocity as they all have an interest in increased network value over time. This have lead to discussions over clever ways to create ‘velocity sinks’ in order to increase the token value. However, we perceive this as not a viable way to create value. Don't even try creating artificial value where none exists. A common example of where a utility token may be needed is for a decentralised markets in the sharing economy. Mike Novogratz, founder of crypto merchant bank Galaxy Digital Management, likes to highlight the example of a decentralised model for ride-sharing. It's also a good example of why utility tokens won't accrue value. Uber is the highest valued private tech company in the world with a market capitalisation of $69.9bn. In a Decentralised-Uber (dUber) equivalent little value would likely accrue in the dUber token itself. We can think of that difference in value between Uber and dUber being mainly due to the radical reduction in the 25%+ cut that Uber captures in fees. This fee would by definition be almost eliminated in a dUber world. As a user, the application layer would automatically trade bitcoin, for example, into dUber tokens in real time so the user never actually holds onto it for a substantial period. You may not even realise there was a token in the middle, and potentially only see you BTC balance change following the ride. Lastly, utility tokens may not accrue value due a lack of network effects because of, funnily enough, utility. Existent crypto assets like Bitcoin or Ethereum can often be used in place of a utility token like the Binance Coin. A concerning number of the projects that come across our desk at Apollo Capital do not need their own native token, and simply staple one of for fundraising purposes. Pure utility tokens might not capture much value at all, because the velocity will likely be high. Many projects might not need their own token. The value of an artificial token used for fundraising is highly questionable. On the investment side, we see value accruing in the store of value that incentivise HODLing, rather than in utility tokens that incentivise high velocity trading. 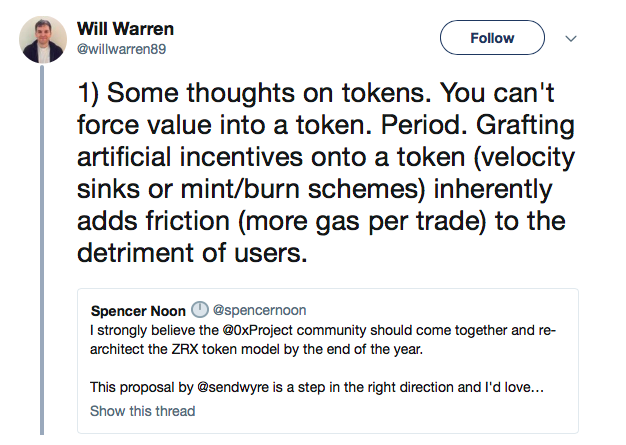 Again, many tokens are not pure cut, and crypto-assets used to fuel smart contract platforms like Ethereum’s ETH can be in part store of value, in part currency, and in part utility for paying gas on the Ethereum platform. There are clearly different degrees of ‘Money-ness’, but these principles should help in deciphering which token will likely have long term value, and which will not. The other big value creator in crypto is governance. We’re in a phase where projects experiment with how governance is distributed and architectured within crypto networks. Bitcoin’s governance is distributed between different stakeholders like miners, developers, users, wallets, and exchanges. In Decred, the coin holders have a much larger say in how the network is developed through their hybrid proof-of work/stake system. Other systems like Tezos are inventing new forms of on-chain governance. The 0x project was thought of as a utility token, but is turning into more of a pure governance token. The relayers in the 0x eco-system do not actually need to use the 0x token for payments, and are using it rather to vote on governance. The team behind 0x realises that as velocity goes to infinity, the payment aspect of 0x is not actually where the value lies. Governance in itself is valuable. If you want to control the future of the protocol you’re investing in or building an app on top of, the governance is very valuable. Do you think Apple considers it's ability to determine what apps can and cannot go on their App Store as valuable? Of course they do. And the app developers would also find it valuable if there was a way for them to contribute to the App Stores governance. At the moment, app developers on iOS have no say on the governance of the Apple app store. Open crypto networks enable community-led governance, or, in classic crypto jargon, decentralised governance. Crypto assets represent new methods to organise society based on merit and free markets. Governance is a critical factor in these networks. This is an excellent article about network governance by Mike Maple, Jr.
How these values are captured are critical issues to think about for developers as well as for investors in this space. In our emerging decentralised world of crypto assets, Money-ness and Governance are two of the leading value creators. This is where Apollo focuses investment.